Enjoy an old fashioned shaved ice after school from Kona Ice, at 1:40 and 3:00 in front of the school. 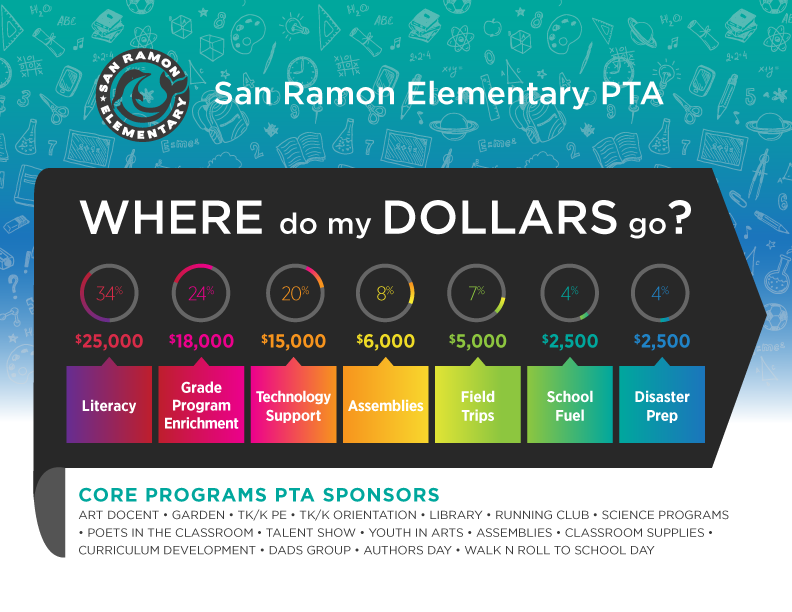 San Ramon Elementary School PTA will receive 30% of all proceeds. Lat year the school raised over $1500 from Kona Ice sales! Enjoy a night off from cooking! Eat at a local restaurant and support our school. Just mention San Ramon Elementary School and the PTA will receive 25-50% of the proceeds. These take place once a month and are advertised via the Splash newsletter and our school app. Visit www.smile.amazon.com and select 2036 San Ramon Elementary PTA as your beneficiary. A portion of your purchases made on the Amazon Smile site will automatically be donated. You can also see your donation amount grow right on the site. Clip and save your Box Tops for Education from all of your favorite foods. Turn them in to your child’s classroom and the PTA will do the rest. This simple way to give brings in hundreds of dollars for our school. Celebrate the 50th Anniversary of our school! We will have catered food, drinks, games, music and more. Community alumni welcome! Visit with old teachers and classmates. Buy Tickets! Moms will enjoy a special comedy night at Trek Winery. Buy Tickets! Watch our multi purpose room transform into a bookstore! Your purchases raise funds for our school library. Dad’s take an afternoon off and enjoy a round at Indian Valley Golf Club, followed by dinner, and a raffle! This is a super fun event for the kids and teachers! Prior to the event, students gather donations from family and friends on their pledge sheet or online (New this year!) more info to come. Dads get dressed up and take your darling daughter(s) to a special school dance, just for you. Enjoy a special night designed just for you and your son(s)!